According to good ol' Merriam-Webster, the definition of confidence is a feeling or belief that you can do something well or succeed at something. While it hasn't always been, my confidence in succeeding at being ME is very high. I am proud of my height, thankful for all of the unique gifts that God has given me and strive to celebrate the one-and-only me that that is on this earth every single day. So when I saw this amazing shirt from Forever 21 that I felt celebrated my high level of height, I purchased it without even thinking about it. 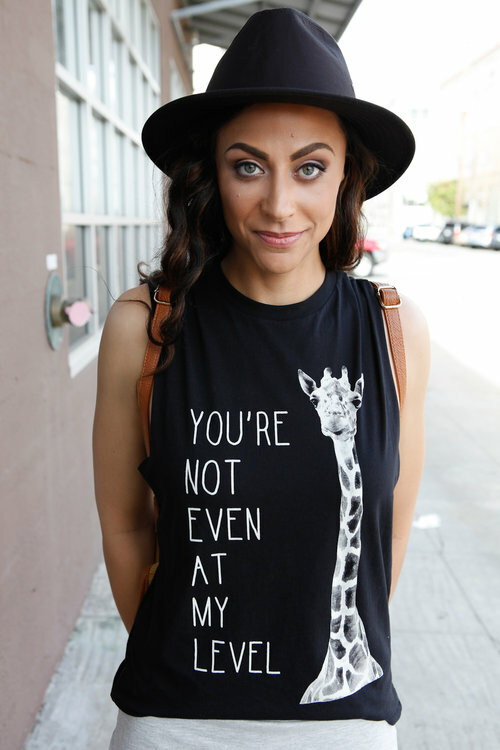 Now, some would call wearing a shirt that says you're not even on my level a bit cocky. So I decided to look that definition up too and here is what MW had to say: having or showing confidence in a way that is annoying to other people. I found this definition to be very interesting. So I am cocky if someone is annoyed by my display of confidence? Well then, I guess you are just going to have to call me cocky then because I don't plan on ever changing the way I let my confidence shine for anyone's annoyance of it. We were built by God to be exactly the way that we are. Every single attribute was selected specifically for us to achieve and succeed in our purpose. So if you want to be annoyed by the confidence I convey from the gifts that I have been given, give me any label that you want. Remember, nobody and I mean NOBODY is on your level. We all have our own, exclusive level, that is untouchable. Each one of us was specifically made to achieve something that no one else can. Embrace your irreplaceable self, foster the fact that you can succeed in anything that you do and walk tall with your cocky self.